We know that in Long Island, you have a lot of choices when it comes to selecting a dental practice. South Shore Dental Care is different from other practices because of the wealth of experience and services that can be found all under one roof. 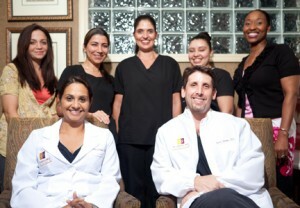 We are home to the team of Dr. Dory Stutman and Dr. Khalida Stutman, both highly experienced in dentistry. Dr. Dory Stutman has recently received accreditation from the American Academy of Cosmetic Dentistry (AACD). This means he has been officially recognized for his skills, experience and expertise in the field of cosmetic dentistry. Only about 336 dentists and dental technicians have become accredited so this is a huge accomplishment and says a lot about his cosmetic dentistry skills. Dr. Khalida Stutman is highly skilled in the field of orthodontics and dental implants. She dedicates approximately 100 hours a year to attending dentistry seminars in the fields of cosmetic dentistry and dental implants to ensure that she is up to date on the latest techniques and treatments. She offers both traditional orthodontic solutions, as well as Invisalign clear braces. Whenever you come to our office, you will have two skilled doctors available to evaluate your smile and give second opinions. Also, with the combined skills of Dr. Dory and Dr. Khalida, we can provide quality cosmetic dentistry, orthodontics, implants and gum contouring all from the same office, making it more convenient for your smile. No matter what dental procedures you require, we have two skilled doctors that can address all your smile needs in one convenient location. Give us a call to learn more or schedule your appointment. by: Dr. Stutman's Office at March 26, 2013 .